In order for your desk to be made available online, please ensure that the Can Book on Website checkbox is checked, within your desk setup. In order for online desk bookings to work, you will need the Desks Portal module installed within Operate. If you go to Settings > General > Portal and you do not see a Desks option, then you need to install the module. Otherwise, please skip this section and proceed to the Configure your Desk Bookings section below. Go to the Operate Settings > Integrations and select Portal on the left. Look for Desks in the list and click Install on the right. As soon as the Desk module is installed, you will see two different buttons: Open and Uninstall. Please click Open to continue. Go to Settings > General > Portal > Desks - if your module is already installed. Select the Venue where your desk is available. 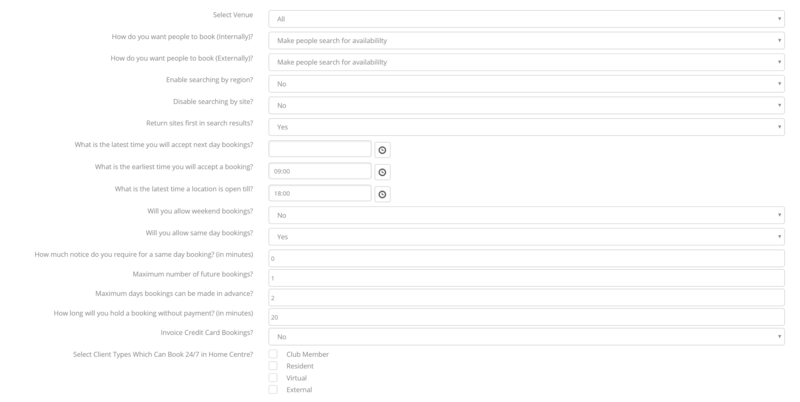 Choose how you want internal and external customers to book - either by using a calendar or an availability search tool. We recommend using the Calendar view for internal members so that they can see when time slots are unavailable. Use the availability search for external customers (coming from your website; who aren't already members of your portal). Choose whether you want to restrict bookings to home centre, for internal customers. Select NO if members are allowed to book at all company locations. Select YES if you restrict booking to the home center only. Enable or disable searching by region - Set to NO unless you have regions configured. Enable or disable searching by site. Select whether you want to return sites first in search results - Select YES if you want the home site to return results first. Add how much notice you require for a same day booking (in minutes) - This is a buffer time between when a member books and when they can actually use the room (e.g if it's 9am and this is set to 30 mins, the next available time slot is 9.30am). Set the maximum number of future bookings - Minimizing the maximum number of future bookings prevents a member booking out a desk permanently for a set period of time. Set the maximum days bookings can be made in advance - Maximum days in advance is also limiting how far in the future a member can book. This is useful if your desk inventory may be subject to change because it depends on your office occupancy (if you sell all your offices you wont have any available desks). Choose how long will you hold a booking without payment (in minutes). Select whether you want to hide the room layout selection. Select whether you want to invoice Credit Card Bookings. Select the Client Types Which Can Book 24/7 in their Home Centre. This setting will override other settings around earliest and latest booking times and weekend availability for members within the selected Client Type. Step 2: Add your Desk Terms & Conditions. Use the text editor to add Terms and Conditions that will be displayed on your Member Portal, when customers want to make a booking. Once you enter your desk terms into the editor, a link will appear on the online booking page asking that the customer checks the box to agree to them – these can be opened and viewed in a new browser window, if the customer wants to read. The booking will not move forward unless the customer checks the box stating that they agree to your terms and conditions. Once you have completed the desk setup, you can copy the html code below your settings, and send it to your webmaster to embed into your website or contact the Operate team if you require assistance. When a customer books using the widget, they will be taken to your Portal to complete the booking. The process will automatically walk them through selecting a desk and making their booking, setting up a new account and making immediate payment for the booking. If your customers are having trouble booking the desks you have made available, please ensure that your Availability app does not block the dates they want to book. Making a desk available on the Portal will also enable it on the external booker you can use on your website (as shown above). For the moment, there is no option to enable the Portal or booker separately.